A white bottle decorated with bright blue stripes, contains 3 ml of Realash eyelash conditioner. The cosmetic is transparent and fragrance-free which is good news for all allergy sufferers. 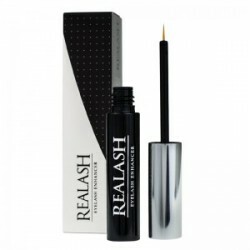 People, who are not so good at manual works, will also make Realash one of its favourite cosmetics because its application does not cause any problems, and is fast to perform. Distributing the cosmetic on upper eyelid only is enough to receive a single Realash eyelash conditioner dose. Systematic 14-day application makes eyelashes stronger. If applied longer, eyelashes turn into being thicker and denser. The extension is hard to notice even if applied a month. The truth is, eyelashes do become longer, but these do not even double their total length. Furthermore, people having sensitive skin may experience irritations in a form of tingling or stinging sensation. The price might also be considered as too high in comparison with the outcomes it produces.